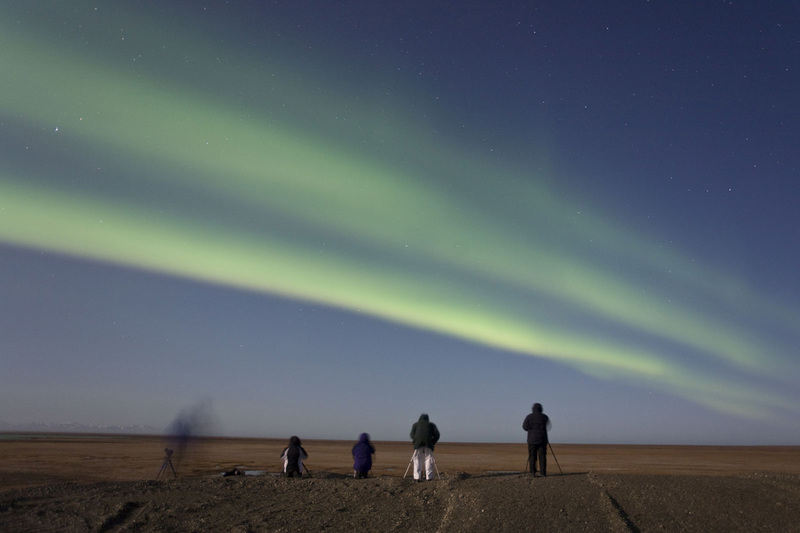 Spend nights photographing the magical Aurora Borealis and days immersed in the Arctic autumn with wildlife and Polar Bears. 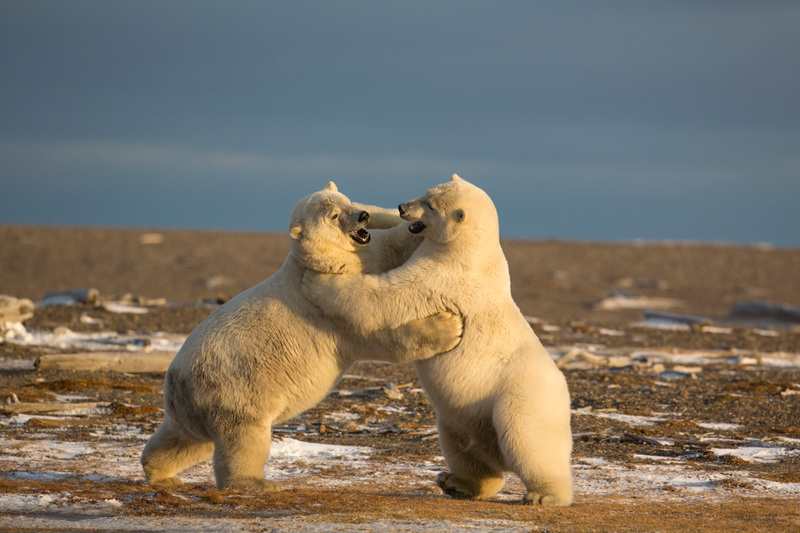 Explore Arctic Alaska by car, boat, and plane with local photographer and naturalist Hugh Rose. 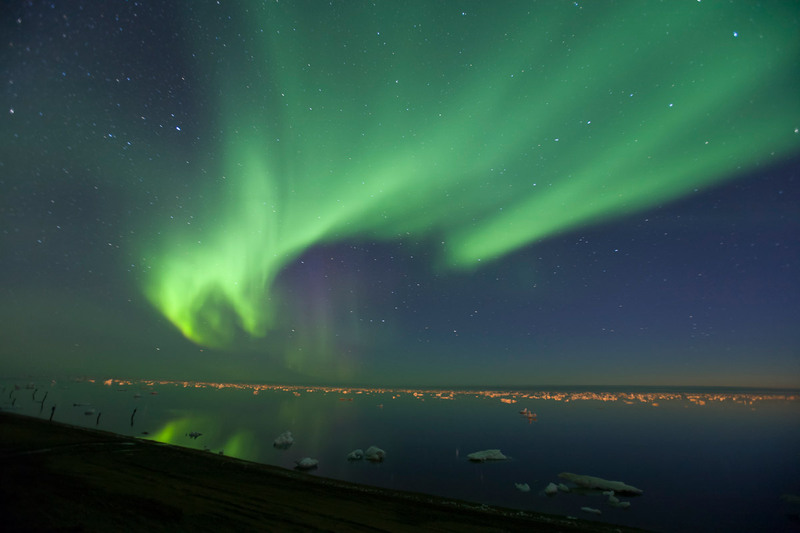 Experience the dancing airbrushed colors painted across the night sky as you photograph and simply enjoy the ephemeral phenomenon of the Aurora Borealis. 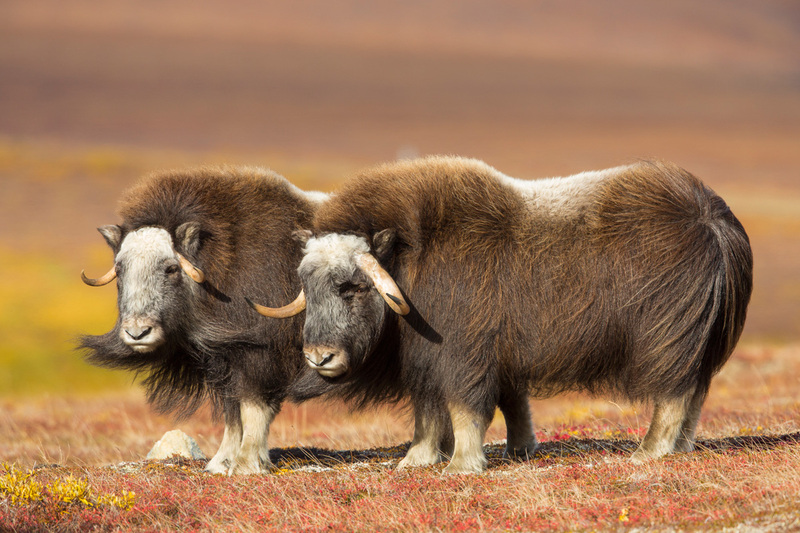 Cross the Arctic Circle and then travel through the picturesque Alaskan landscape of the Brooks Range, decorated in fall colors, to the stark vastness of the Arctic Coastal Plain. 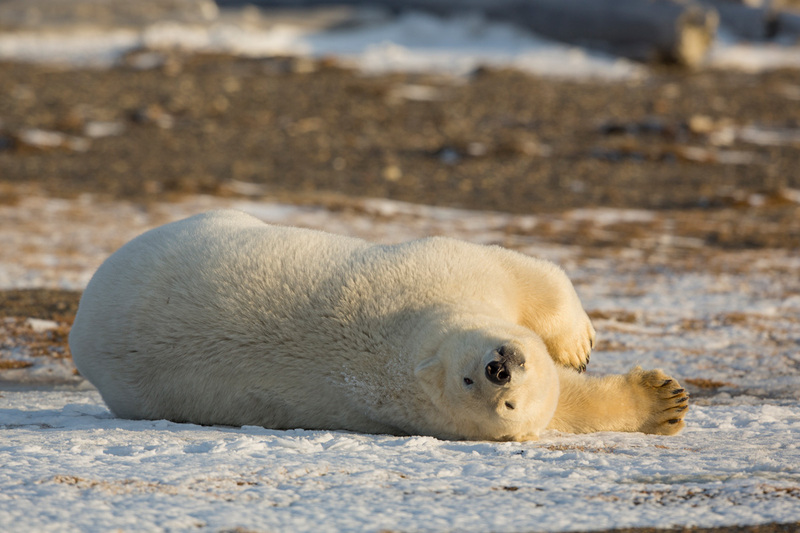 Experience an Inupiat island village where Polar Bears feed on whale carcasses, while they await the formation of the winter ice. 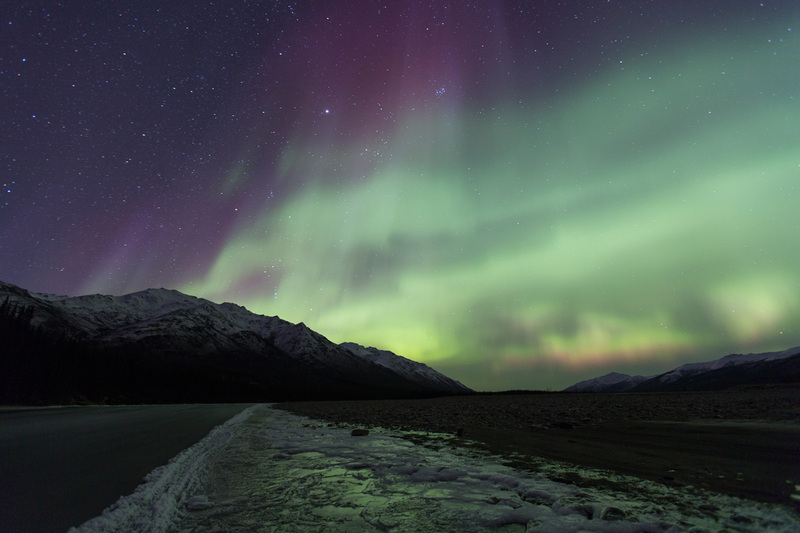 Learn wildlife, landscape, and aurora photography techniques and see nature’s beauty at its finest under the guidance of one of Alaska’s best naturalists. This tour is booked through Cheesemans’ Ecology Safaris. Please use the booking links above. Note pricing & itinerary may change from year to year. 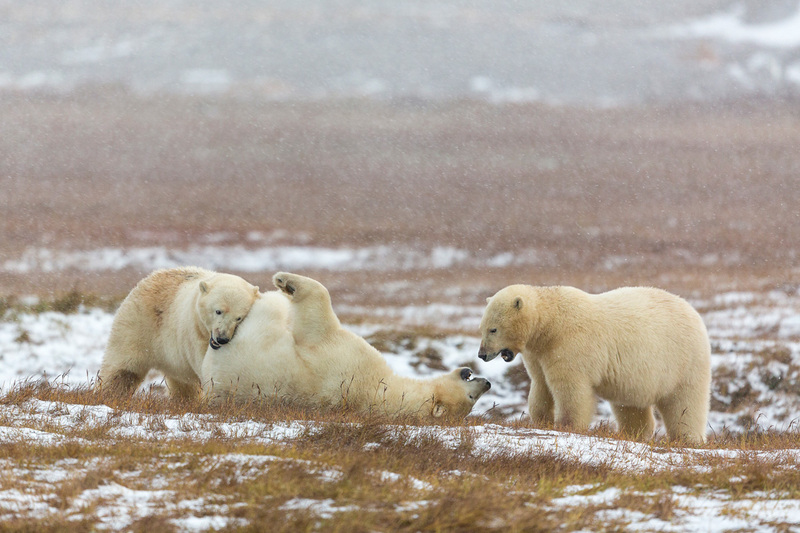 Photograph the magical Aurora Borealis, Polar Bears and immerse yourself in Alaska’s wild Arctic. Arrive in Fairbanks by this evening for a welcome dinner with Hugh Rose. Transfer will be provided to our lodging at the River’s Edge Resort along the banks of the Chena River. 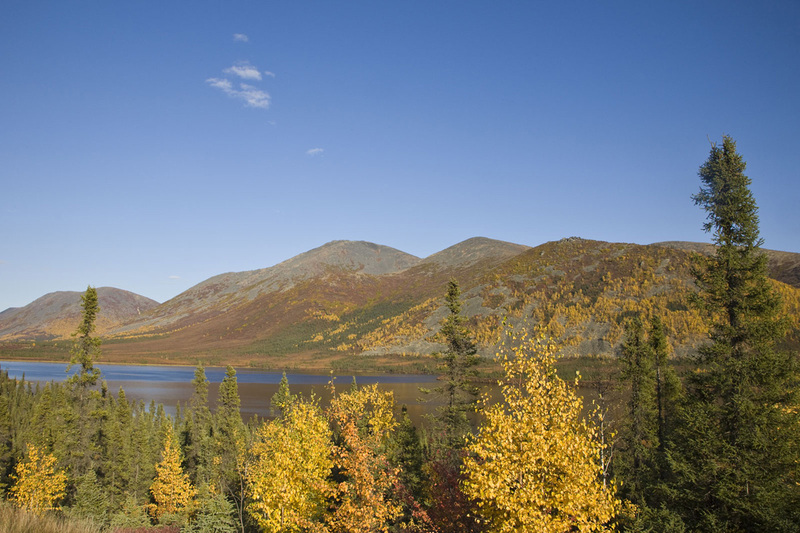 We’ll drive north to Wiseman on the scenic Dalton Highway, the only road in the United States that crosses the Arctic Circle. 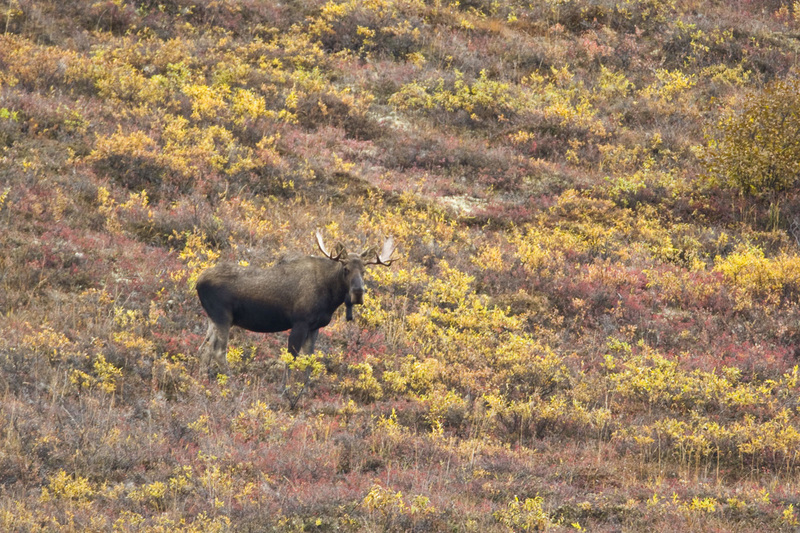 We’ll pass through the White Mountains, crossing the mighty Yukon River, and into the Brooks Range, searching for wildlife along the way and enjoying the hillsides carpeted in fall color. Our destination for the day is Wiseman, a gold mining town that offers a glimpse into the recent human history of Alaska. 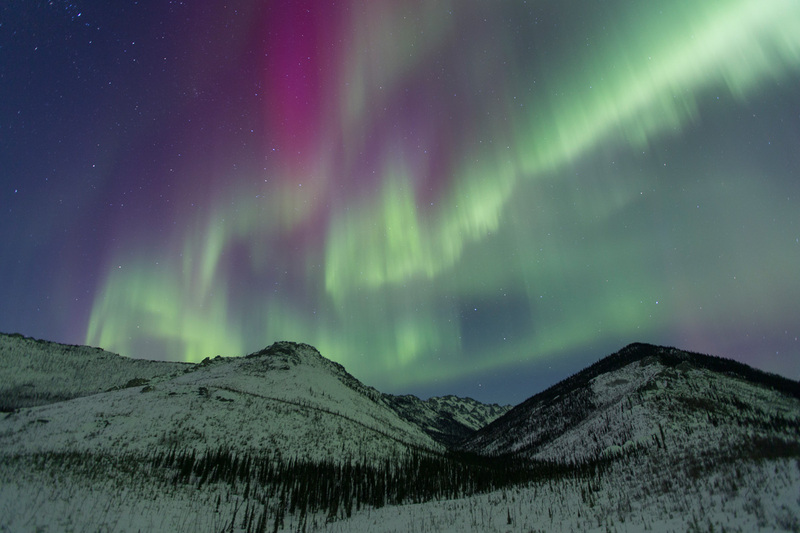 Wiseman is located approximately 60 miles north of the Arctic Circle at roughly 67°N latitude, an excellent location for aurora photography and perfect base for exploration of the Brooks Range. We’ll check in at Wiseman’s unique and historic bed and breakfast owned by Berni and Uta Hicker. 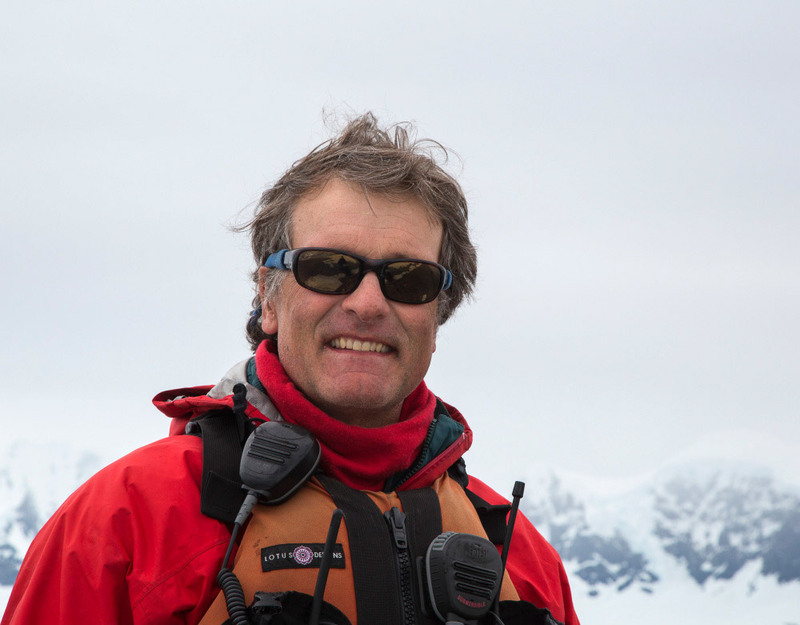 Berni will join us to assist Hugh for the rest of our arctic journey, lending his great naturalist, spotting, and storytelling skills. 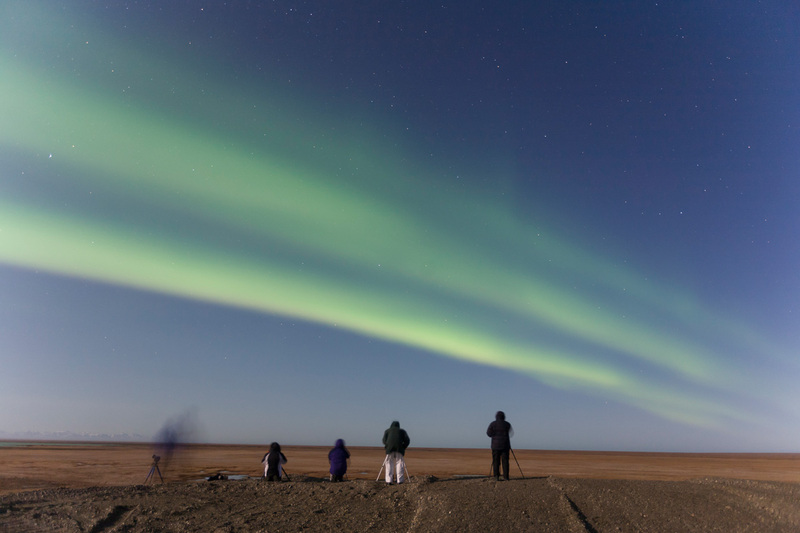 Conditions permitting, we’ll end with nighttime aurora photography and learn techniques to obtain stunning images of this spectacular and ephemeral phenomenon. 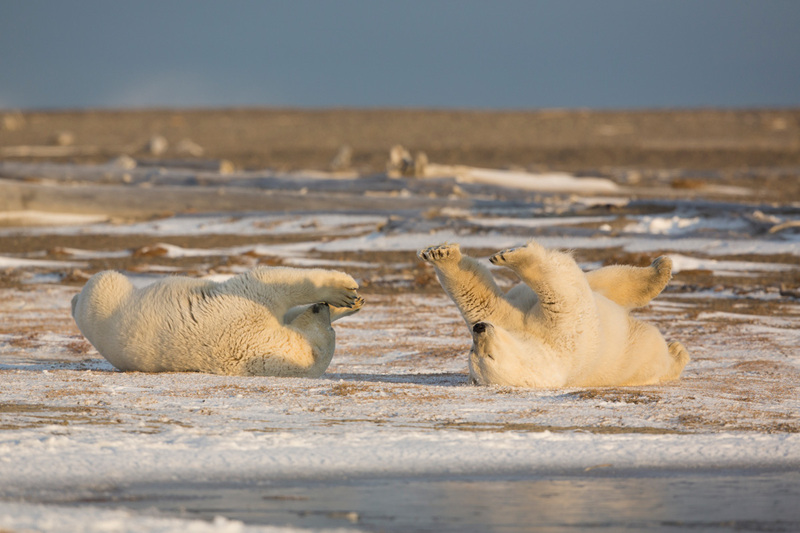 We’ll depart early for our 240-mile drive along the Dalton Highway to Prudhoe Bay at the edge of the Arctic Ocean. 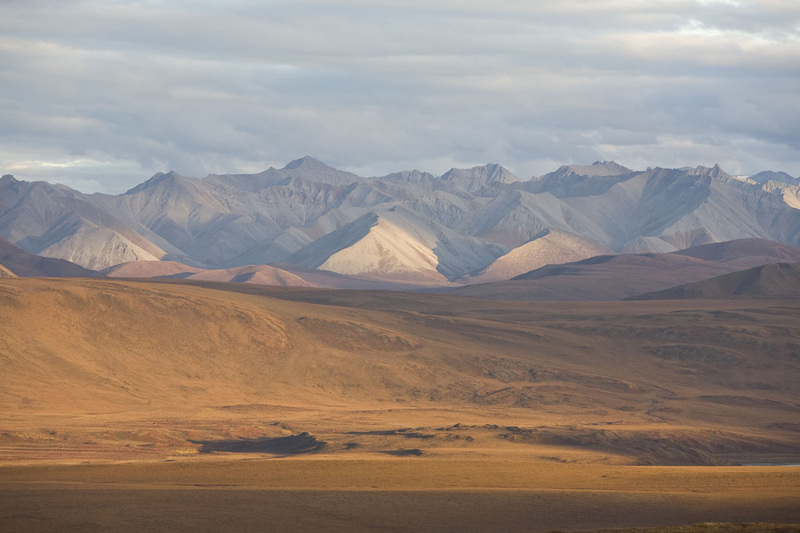 As we climb the Brooks Range, we will scan the boreal forest for Gray Wolf, Moose, Grizzly Bear, and Black Bear. 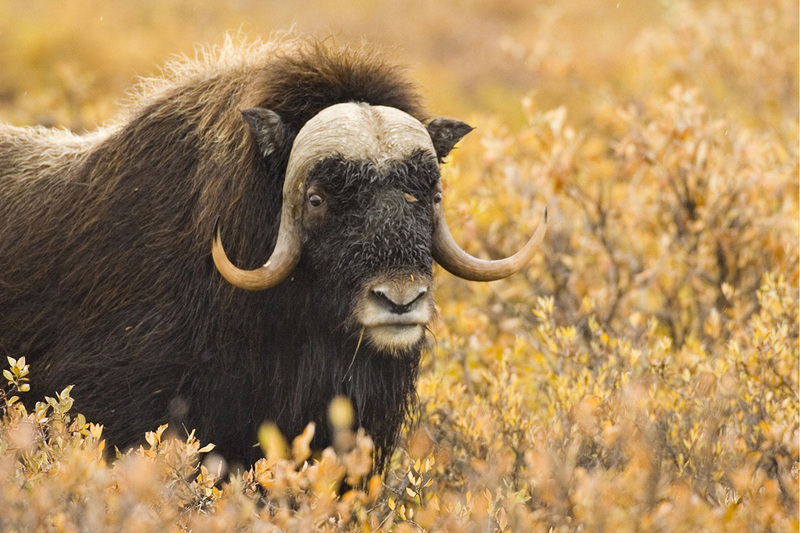 We’ll go over Atigun Pass, highest pass in Alaska at 4,800 feet and descend the north side of the Brooks Range into a world devoid of trees and home to many species of arctic wildlife, such as Muskox, Red Fox, Gray Wolf, and Caribou. 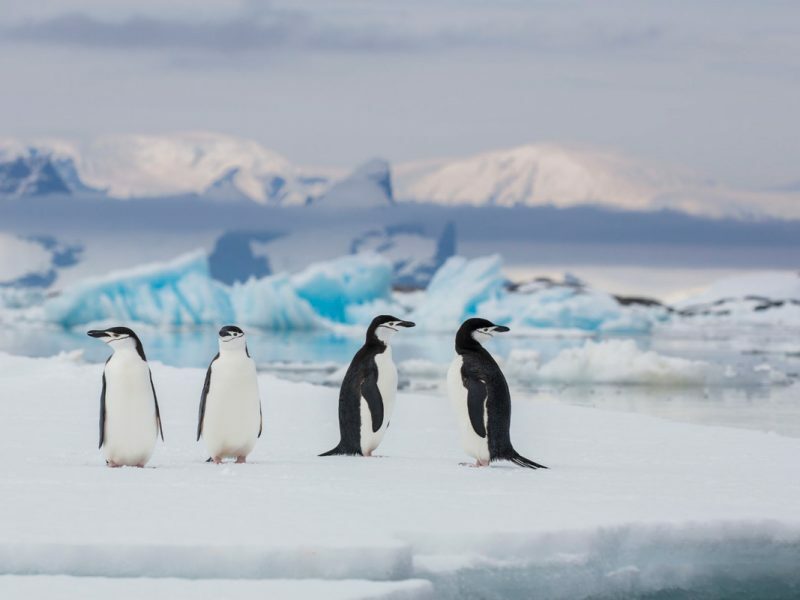 Birds of prey, including Gyrfalcon, Snowy Owl, Short-eared Owl, and Rough-legged Hawk, hunt the open arctic tundra while other migratory birds, like Tundra Swans, Greater White-fronted Geese, and Pacific Loons, gather in flocks to migrate south ahead of the oncoming winter freeze. The Trans-Alaska Pipeline snakes over the open tundra parallel to the road, adding another component for our landscape photography. We’ll arrive in Prudhoe Bay in time to enjoy a hearty dinner. 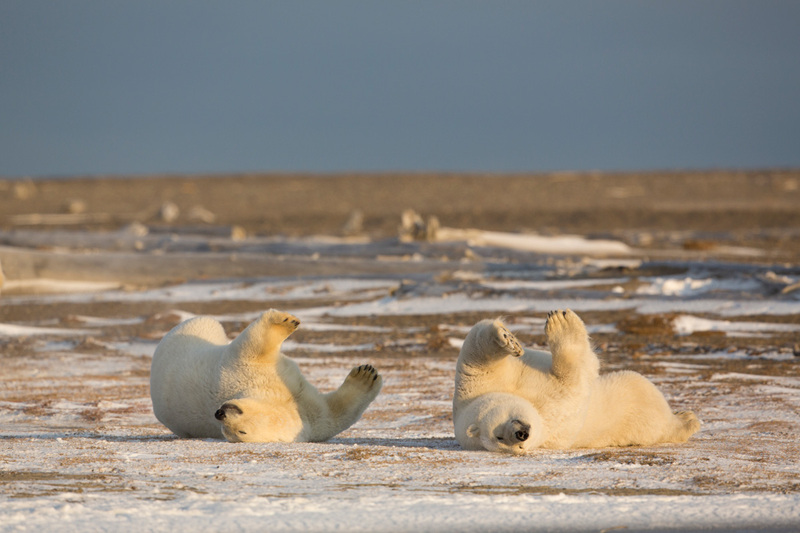 Before our mid-day flight to the village, we’ll search the Prudhoe Bay area for Arctic Foxes, Snowy Owls, and other wildlife. 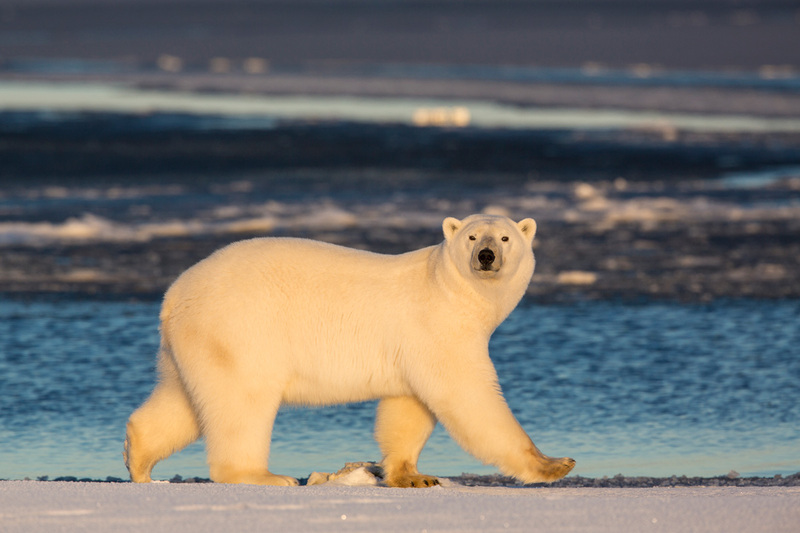 Our flight takes us over the spectacular Arctic Coastal Plain and coast of the Arctic Ocean and we may see herds of Caribou, Muskoxen, Grizzly Bears, and Polar Bears. Our schedule while in the village will depend on weather and individual interests, but the best photography tends to be early in the morning and later in the evening, so we will schedule meals around our photographic forays. 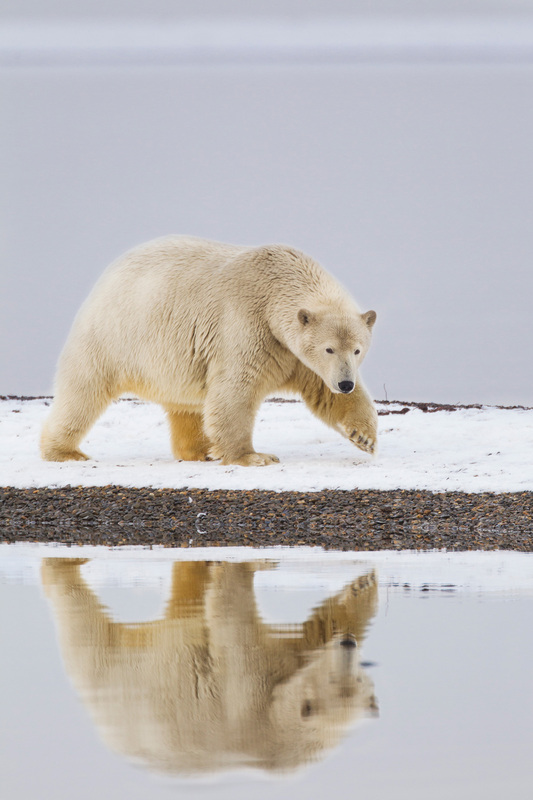 Although bears can sometimes be seen prowling down streets early in the morning, we will drive to the shoreline to photograph in their natural environment. 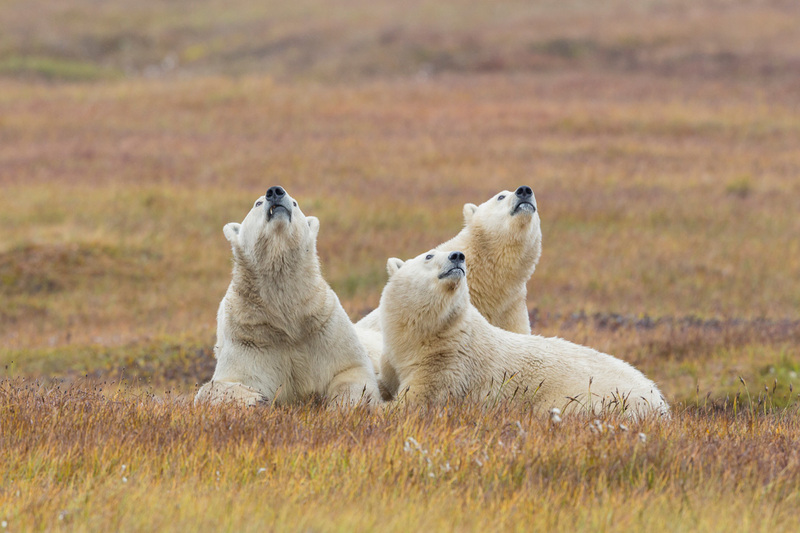 In addition to viewing the bears from land, we will also have the opportunity for small-boat excursions to observe and photograph bears on the islands near the village. 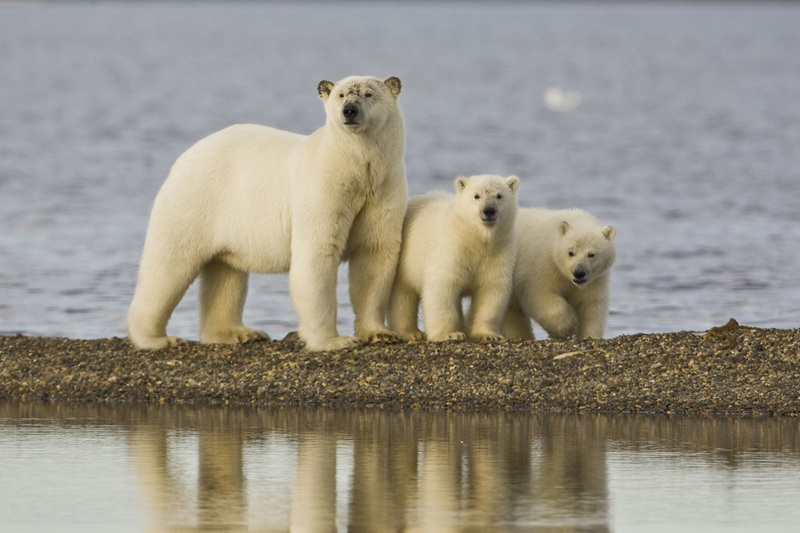 Boat rides provide excellent photographic opportunities from a unique perspective because they put us at the bears’ level and they allow us better accessibility to the bears, many of which rest on low-lying barrier islands just offshore. 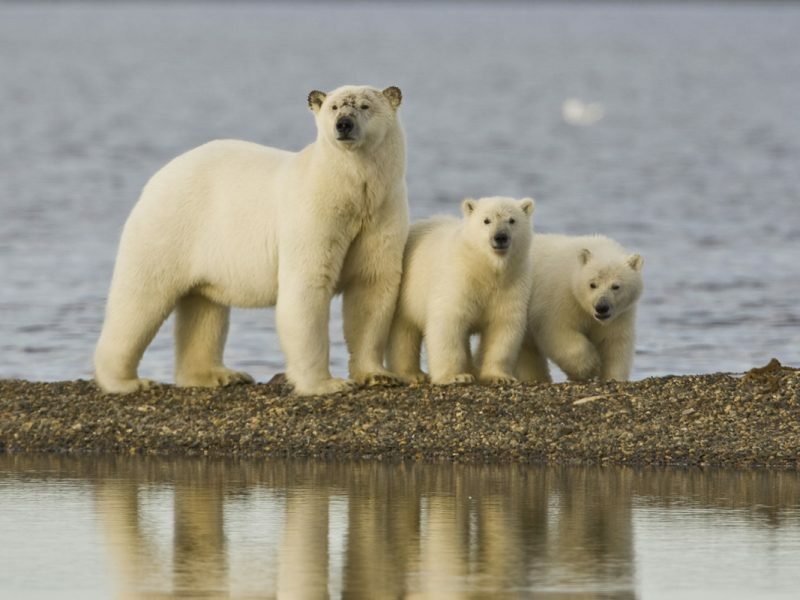 Polar Bears are the primary focus of this part of the safari since they are not found anywhere else during the trip, but we hope to see and photograph other wildlife as well, such as Grizzly Bear, Arctic Fox, Snowy Owl, and many species of shore birds and sea ducks. We may also have the privilege of witnessing (and maybe photographing) the Bowhead whale harvest, an amazing Inupiat tradition. This would be a unique opportunity to watch something that few get to see. 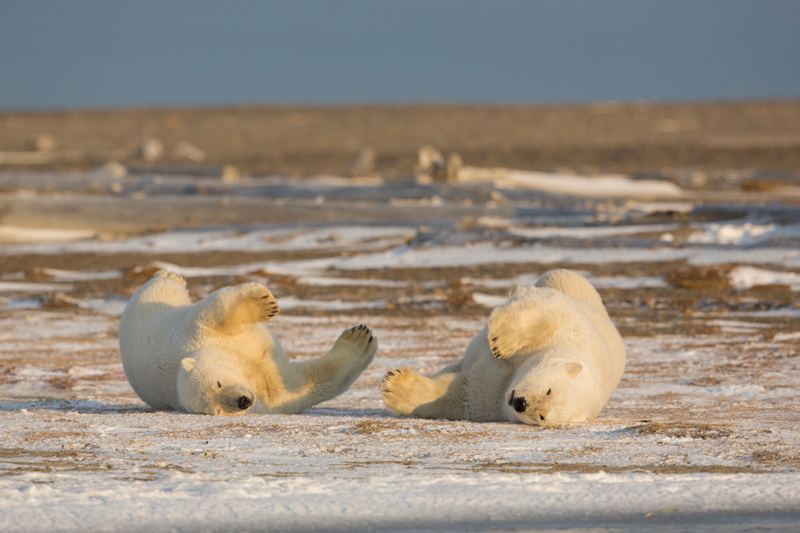 Enjoy one last opportunity to observe Polar Bears before we fly back to Prudhoe Bay and drive south toward Wiseman. 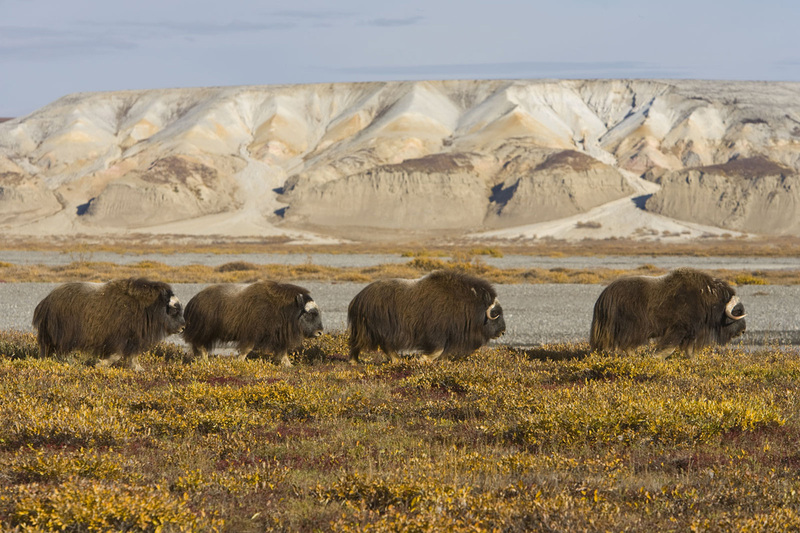 As we drive south across the Arctic Coastal Plain, we’ll search for iconic arctic wildlife such as the prehistoric-looking Muskox. 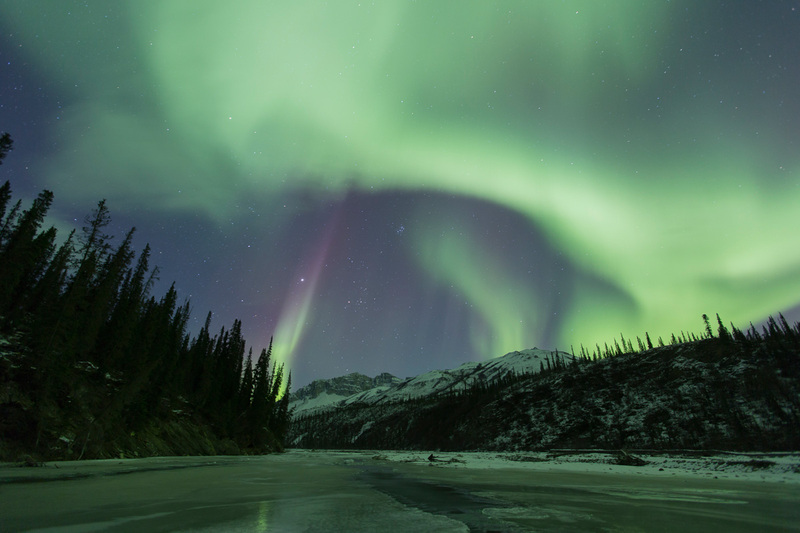 With stops for lunch, photography, and simply to enjoy our surroundings, we will reach Wiseman late in the evening, hopefully after stopping to enjoy and photograph Northern Lights along the crest of the Brooks Range. The following morning allows for a relaxed breakfast before setting out to explore the area around Wiseman. 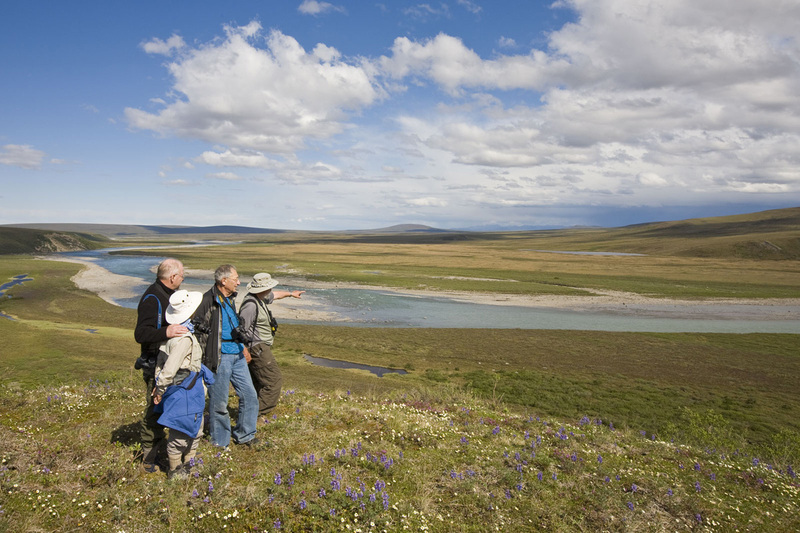 Learn some of the mining history of the Koyukuk River Valley and also search the south side of the Brooks Range for wildlife. 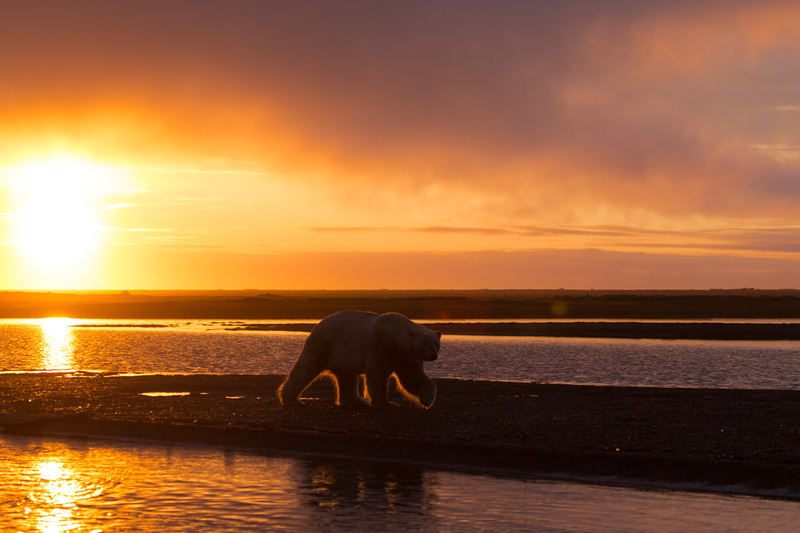 We’ll bid farewell to Berni and his family before we depart south toward Fairbanks. 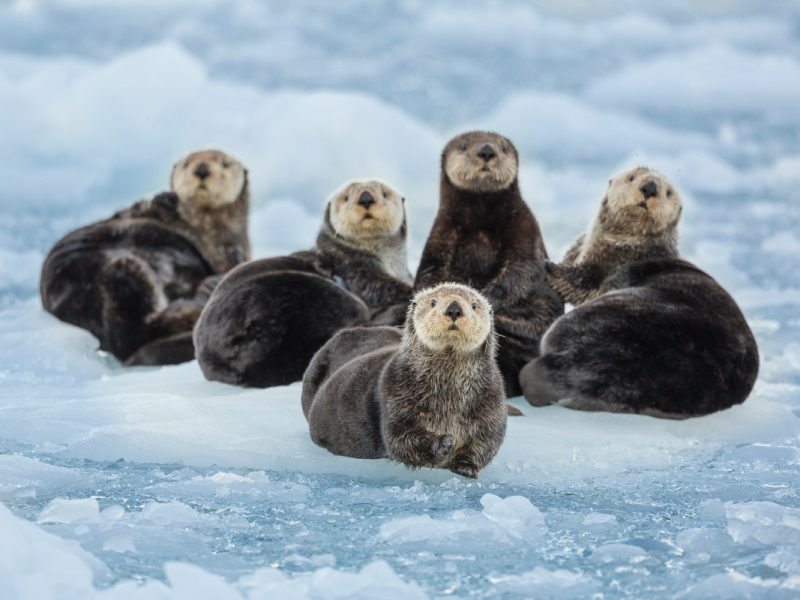 As usual, we will maximize wildlife viewing and photographic opportunities during this day of travel, searching the landscape for one last glimpse of Alaska’s wonderful wildlife. 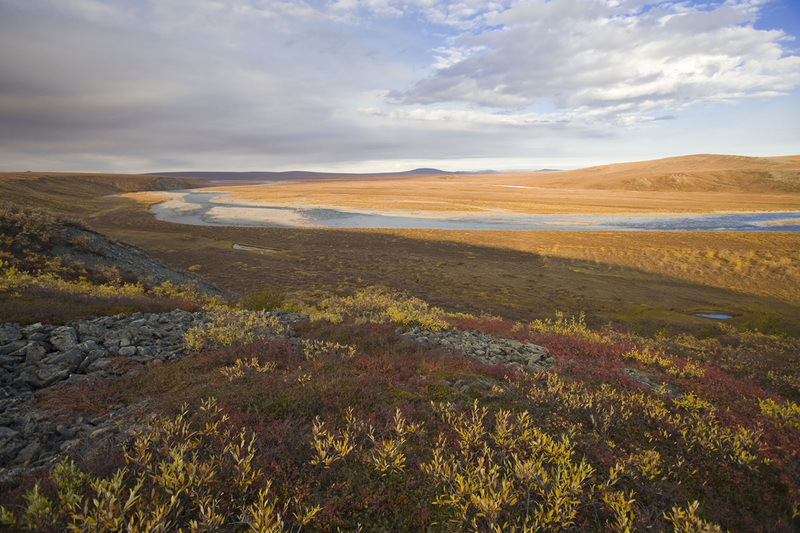 We’ll retrace our path south, crossing the Arctic Circle and Yukon River and returning to spectacular fall colors. 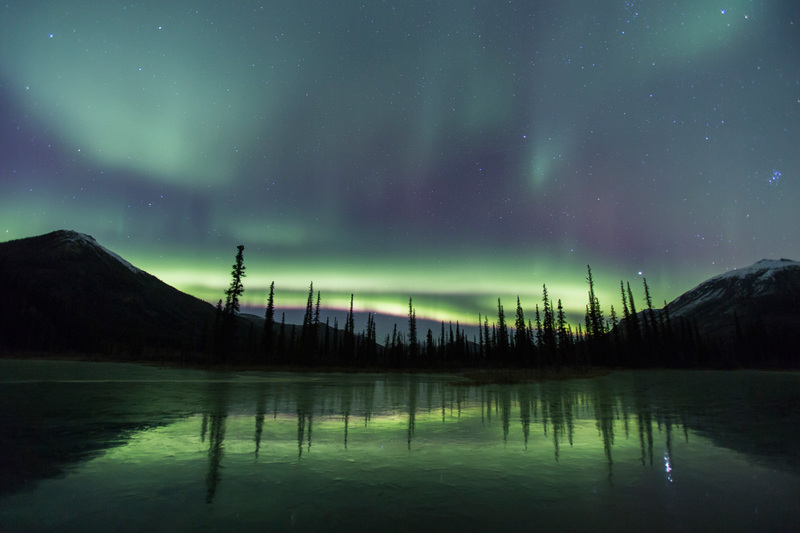 Our journey back to Fairbanks takes us through the historic gold mining community of Fox, Alaska, where we will stop for a farewell dinner together. 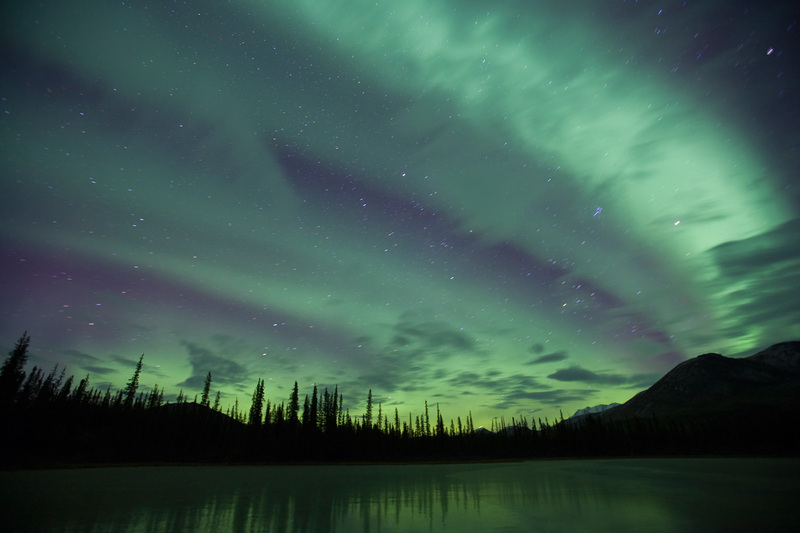 Transfer to the Fairbanks Airport for your flights home or extend your stay. 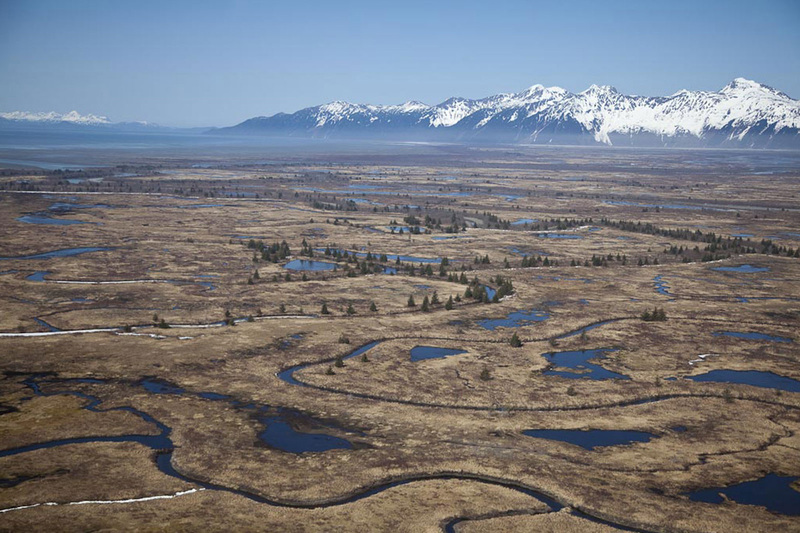 Round-trip flights between Prudhoe Bay and the native village. 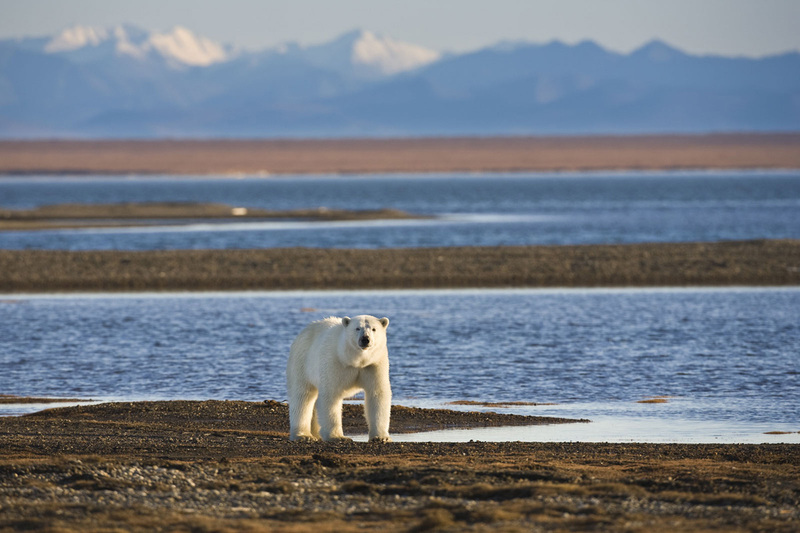 Boat rides to see and photograph Polar Bear on islands near the village. Airport transfers to/from the River’s Edge Resort in Fairbanks. Accommodations for the nights of Day 1 – 9. Meals from dinner on Day 1 through breakfast on Day 10, including premium beer and wine in Wiseman. Gratuities to lodge personnel and for meal service. Airfare (except flights listed as included), airport and departure taxes, and excess baggage fees. Separate airport transfers if booking extra nights somewhere other than River’s Edge in Fairbanks. Emergency medical and evacuation insurance and trip cancellation insurance. Read more about travel insurance. Gratuity for Guides. Gratuities are highly personal in nature and are earned, not expected. As a guideline, we suggest budgeting about $65 to $75 per participant. Alcoholic beverages, except in Wiseman (not available in Prudhoe Bay or the native village). Important Disclaimer – Weather-related Travel Delays: If necessary due to travel delays, cost of lodging and transportation of about $500 per person per additional night in the native village. 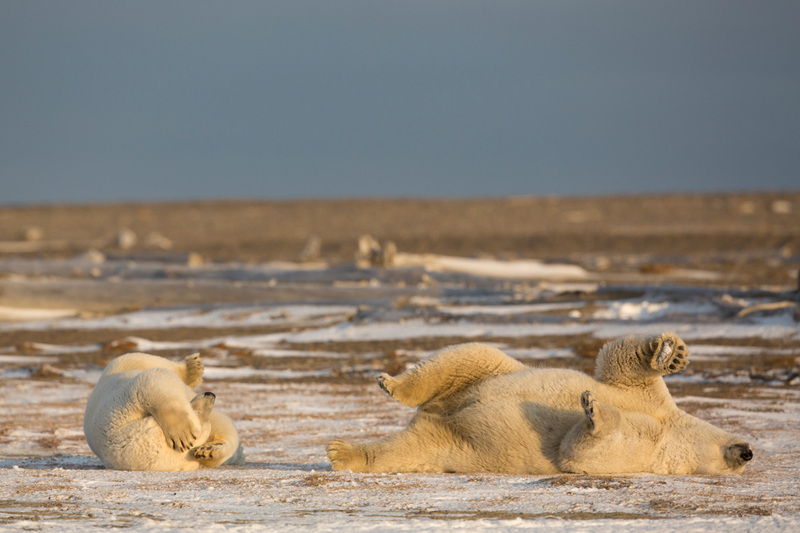 In the unlikely event that our return flight from the native village back to Prudhoe Bay is cancelled due to weather or other circumstances beyond our control, an additional fee of about $500 (estimated November 2016 and subject to change) per person will be charged for each additional night that we have to stay in the village. 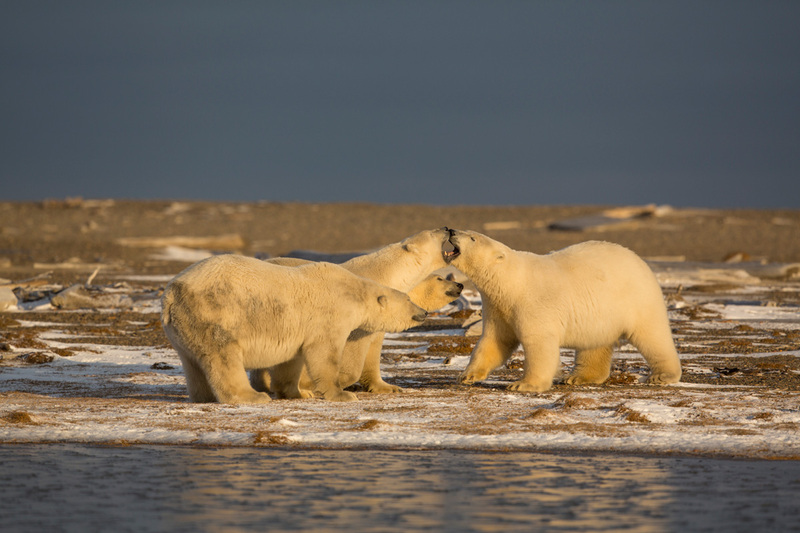 This is to cover the extra cost of staying in the village (higher relative to Wiseman or Prudhoe Bay) and the cost of a rental vehicle so that we can make the most of the situation and continue to view and photograph Polar Bears. 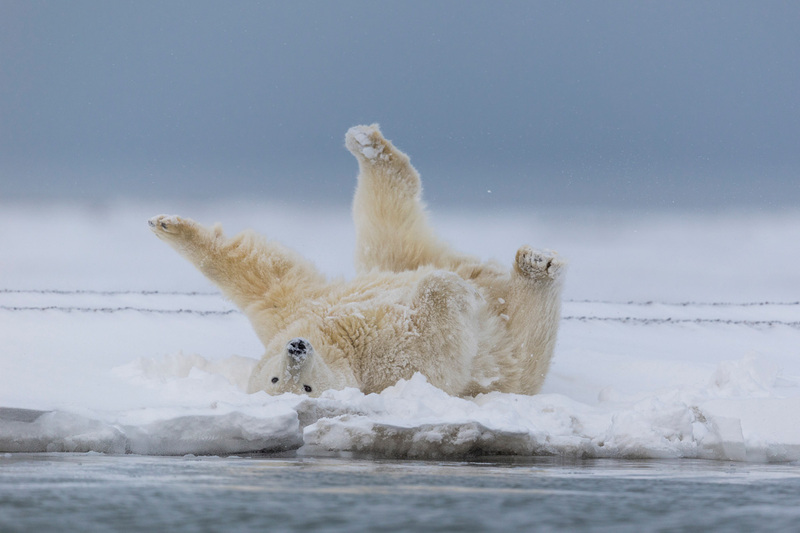 We apologize in advance if it becomes necessary to collect this additional fee, but weather in the Arctic can be unpredictable. Questions about this tour? Fill out the form below and we'll be in touch shortly.